Stein Helyo® RtH range of rotary hearth furnaces is applicable for reheating any semi-finished products, such as round or square billets (carbon or stainless steel) for seamless pipe mills and forging plants; high grade steel ingots for railway wheels; and for heat treatment (annealing, quenching) of wire rod coils. The Stein Helyo® RtH rotary hearth furnace benefits from the digital combustion control a modular design and customized charging and discharging machines. This modern rotary hearth furnace offers a simple and robust design that guarantees easy maintenance. The straight-line furnace structure ensures a long and sustainable machine and refractory life. The 100% lateral burners eliminate the need for roof burners, resulting in less maintenance and heat losses. In addition, the AdvanTek® burner technology provides steelmakers with flexibility and quality: each pair of burners is an independent control zone, resulting in improved heating control and product uniformity. With the addition of Virtuo® thermal solution, operators can make significant energy savings and reduce emissions. Furthermore, fuel consumption is very low, which has a desirable effect on NOx emissions. In addition to new installations, aspects of the Stein Helyo® RtH furnace can be retrofitted to existing rotary hearth furnaces to improve productivity. These include Virtuo® thermal solution and AdvanTek® burners. After more than 30 years of operation, the existing Fives rotary hearth furnace at Tubos Reunidos Industrial (Spain) was revamped with a completely new hearth concept designed to handle higher loads at faster discharging rates. 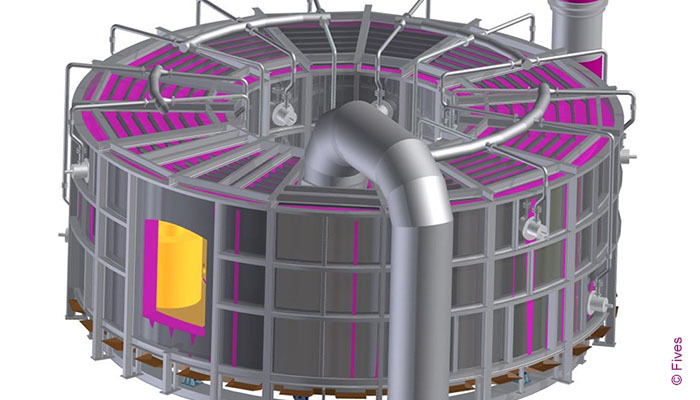 Due to the short shutdown time for the project, the hearth had to be designed on a modular basis, including pre-installation of the refractory material. The Stein Helyo® RtH was chosen for the Acerinox Group’s Roldan, S.A. coil finishing shop in Spain. 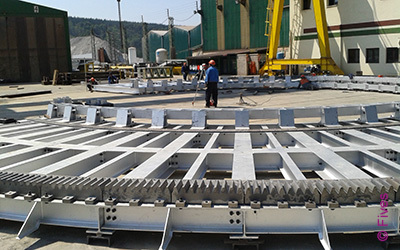 Fives was entrusted with the complete turnkey supply, including roller tables, tilting and discharging machines. This furnace incorporated the latest technology, including high velocity burners, flat roof, etc. The quenching machine design was improved to achieve an excellent recirculating and cooling capacity, together with good temperature homogeneity in the furnace for a high quality end product.